The weather rules. What a change on 20th July from the year’s early sun and warmth to Atlantic wind, cloud and rain. July was the wettest since 2012 with 141mm/5.6in rain. 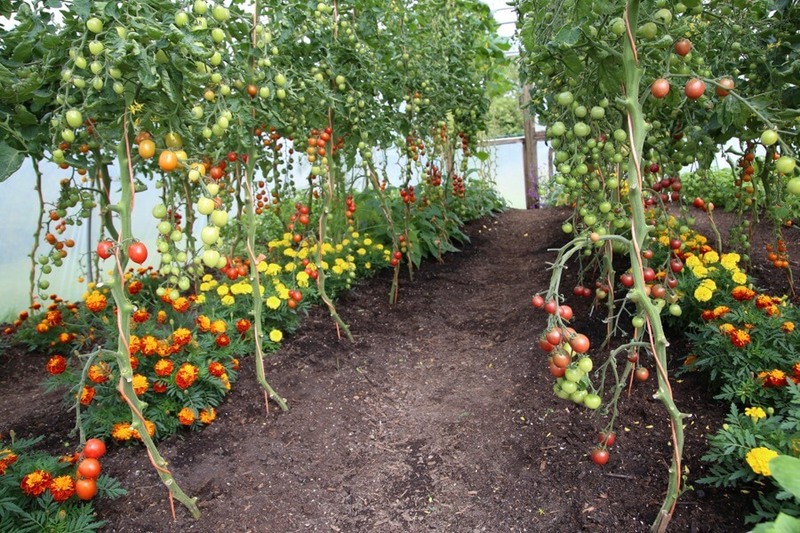 I fear that August will be cooler than average, so we need to keep up to date with new sowings and plantings, and pinch out tomato tops soon, see below. 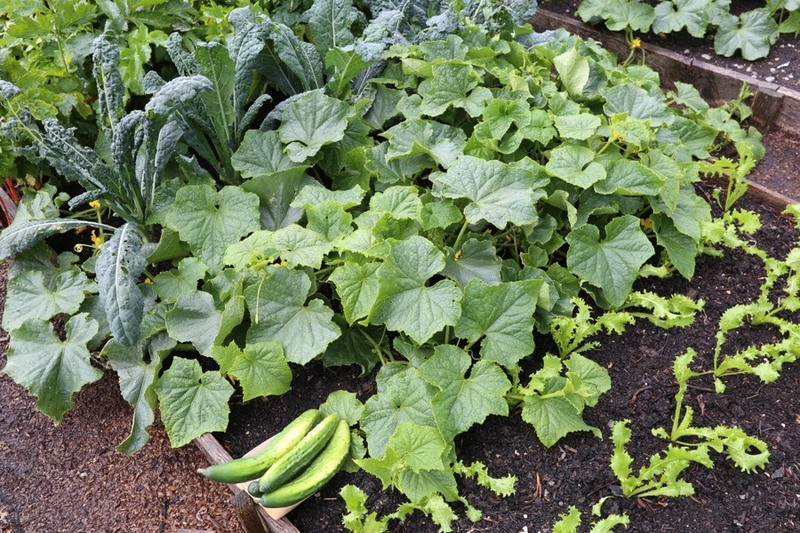 Many second plantings are now growing fast, such as beetroot, broccoli and leeks. 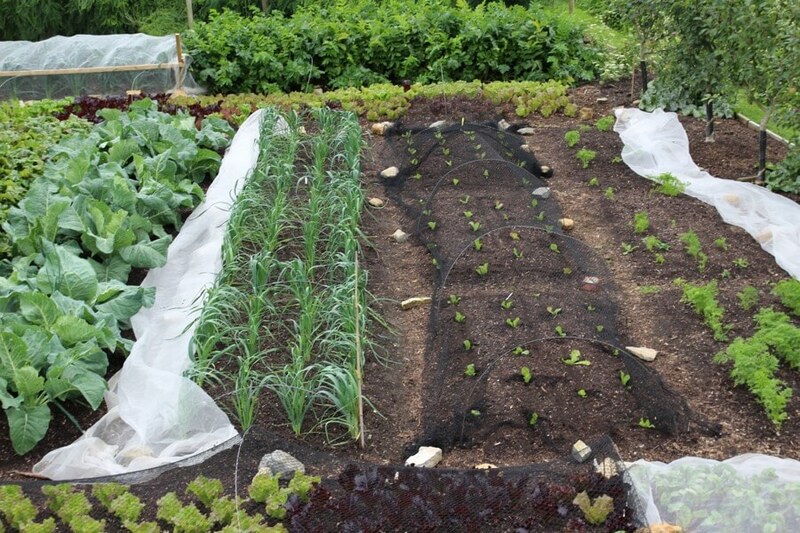 You can still sow kale, chard and above all spinach in August. Spinach has now passed it’s flowering season, therefore August sowings crop for a long time, potentially until next June. Module sowing of 2-3 seeds works well, to plant after 3-4 weeks, in space vacated by summer harvests. Spread an inch of compost before planting, because it’s in the ground until next summer, and the spinach will repay you for that. 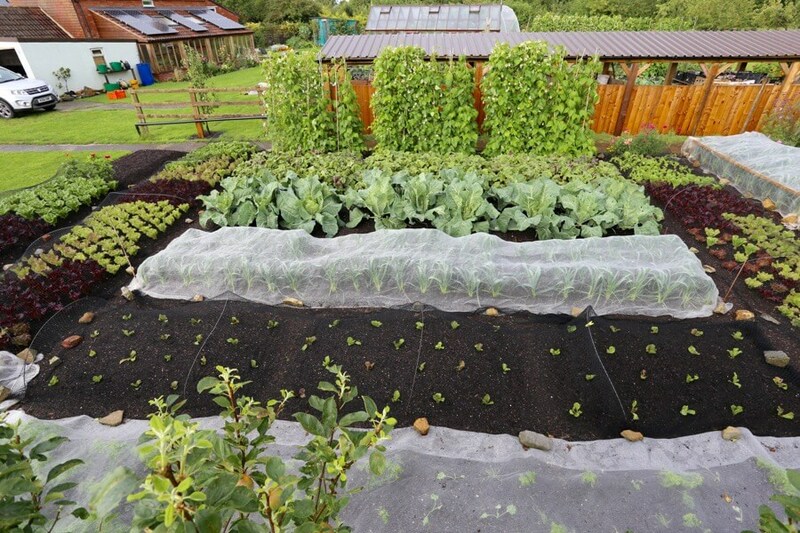 If you have rabbits and pigeons, this anti-bird netting is long lasting and effective, I use it for young plants especially, since are most vulnerable to damage. 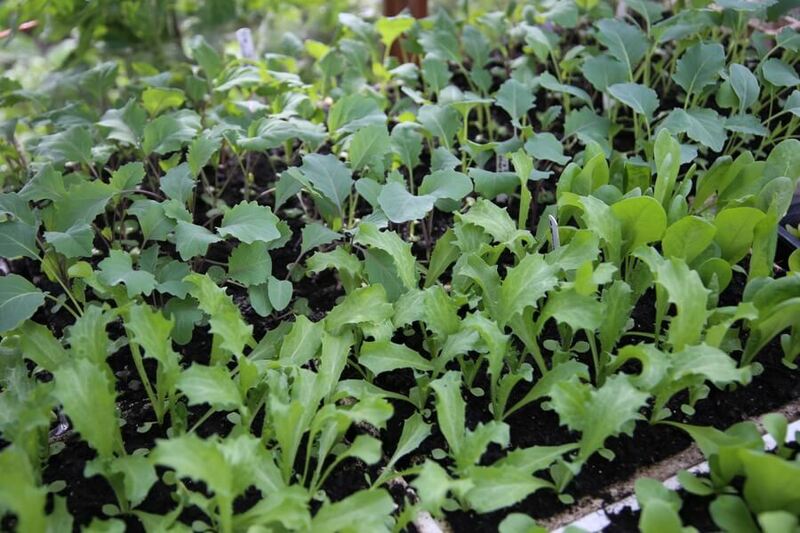 Early August is BEST TIME to sow salad rocket and oriental leaves such as pak choi and mustards, see my sowing timeline for a full list. Claret purple sprouting broccoli, from a sowing on 2th June, later than I had intended! Those who sell fertiliser would prefer you not to know that compost is brilliant at holding nutrients over the whole season of growth. 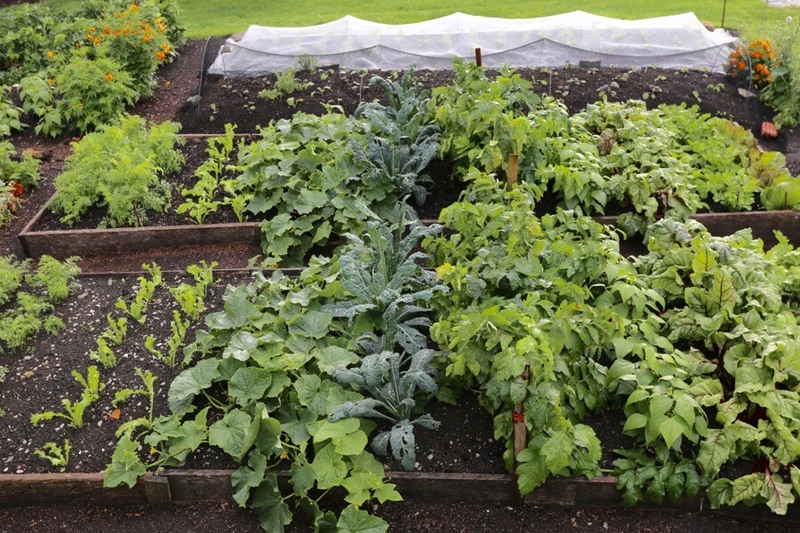 The nutrients in ripe compost are mostly not water soluble, so they do not leach out in rain. 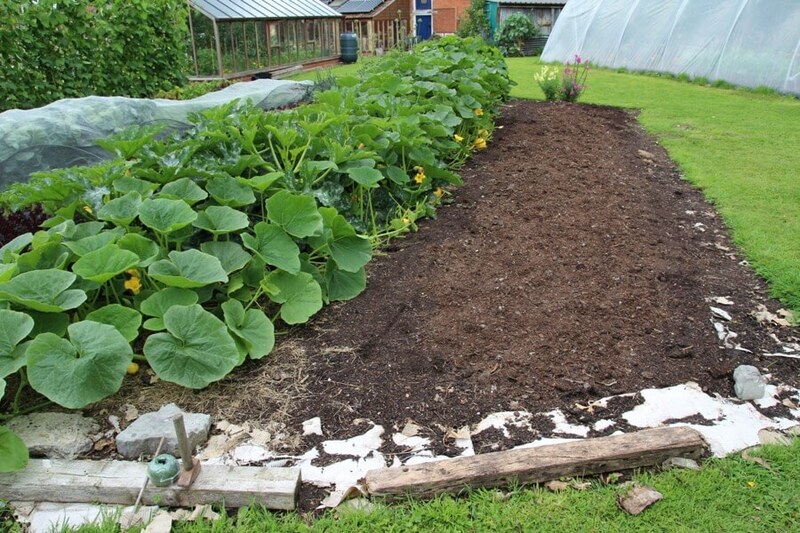 I spread a two inch/5cm mulch in late autumn (although you can spread it at other times, even now), which that feeds soil life and therefore plants all year. 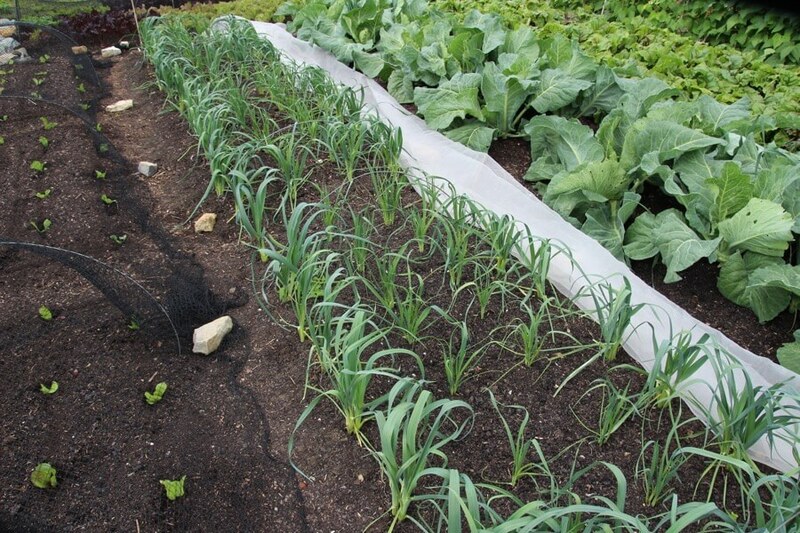 Soil organisms are fed and encouraged by surface mulches. 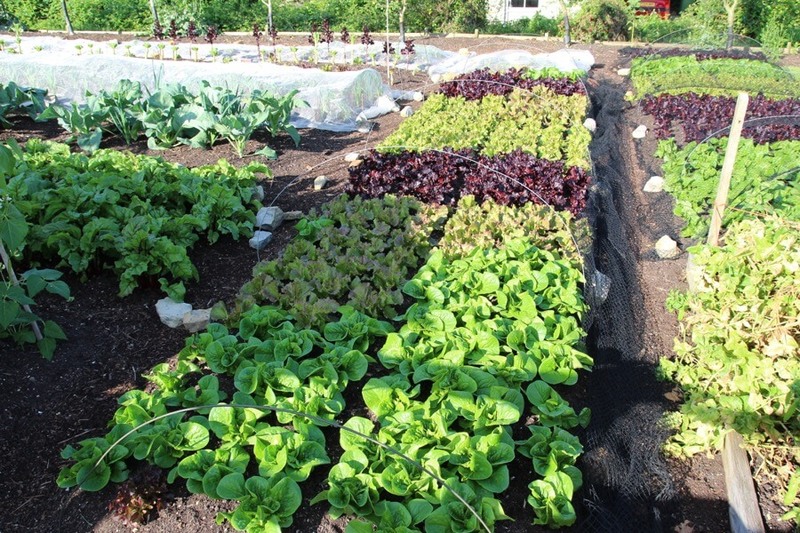 They mobilise food for roots and growth is then steady through the growing season, with no need for more compost before summer plantings. This saves much time. 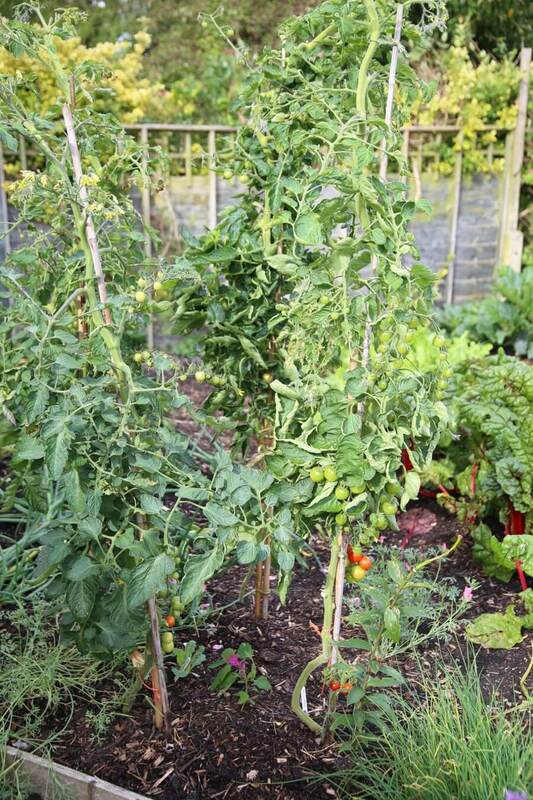 Similarly I compost-mulch tomatoes and do not feed them, unless they are in containers. 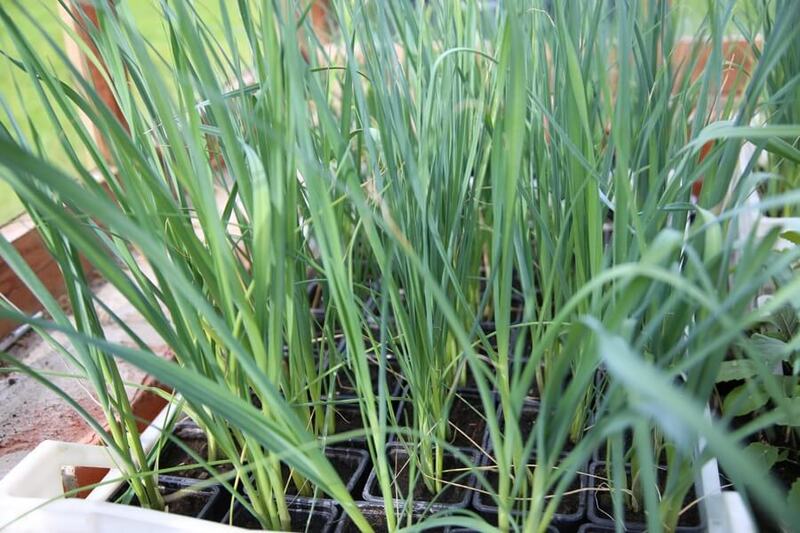 Onions that we multisowed on 17th February and germinated in warmth undercover, then planted late March and fleeced over for a month, have matured nicely. 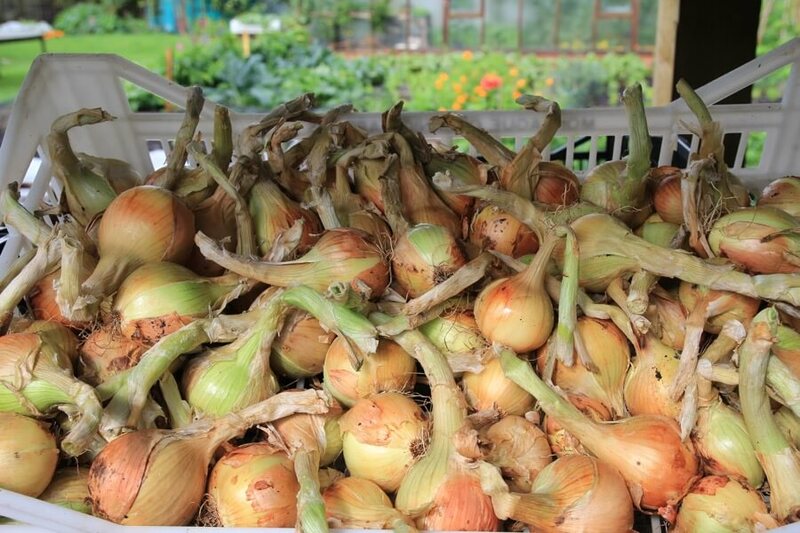 We pulled them mostly around mid July and left them to dry a week in situ. Then we cut the green or yellowing leaves off and laid them in crates undercover, out of the approaching rain. 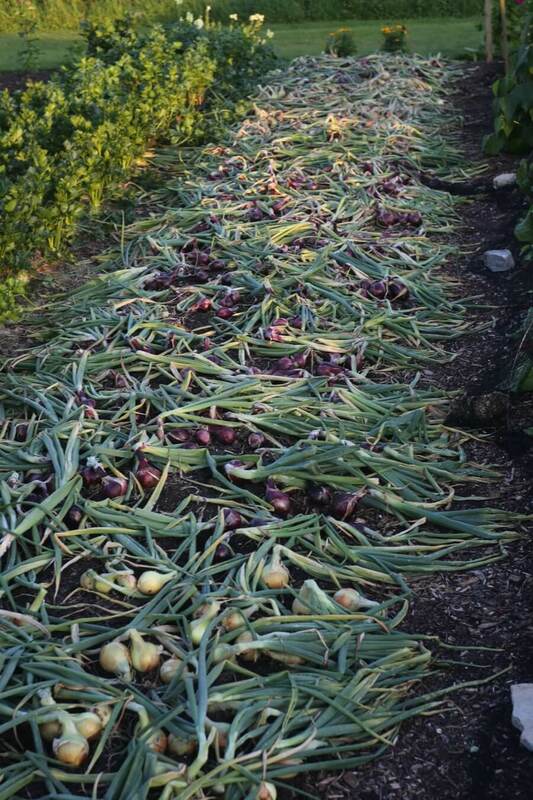 Or you can leave the tops on and then plait or bunch onions, but they need more space to dry their tops, compared to when the main leaves (not stems) are cut. It seems like the tomato season is just beginning, but we need now to prepare for the end as well. 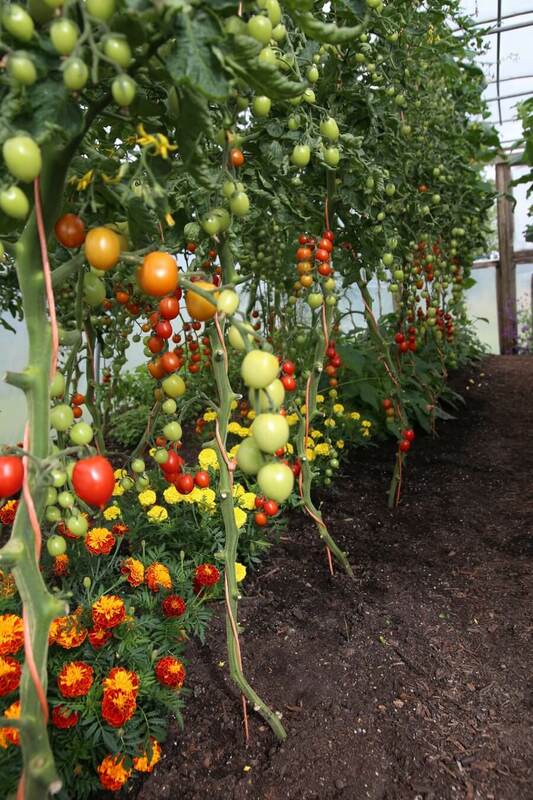 Before mid August in the UK, pinch out the tops of all cordon tomatoes undercover, and continue sideshooting too. 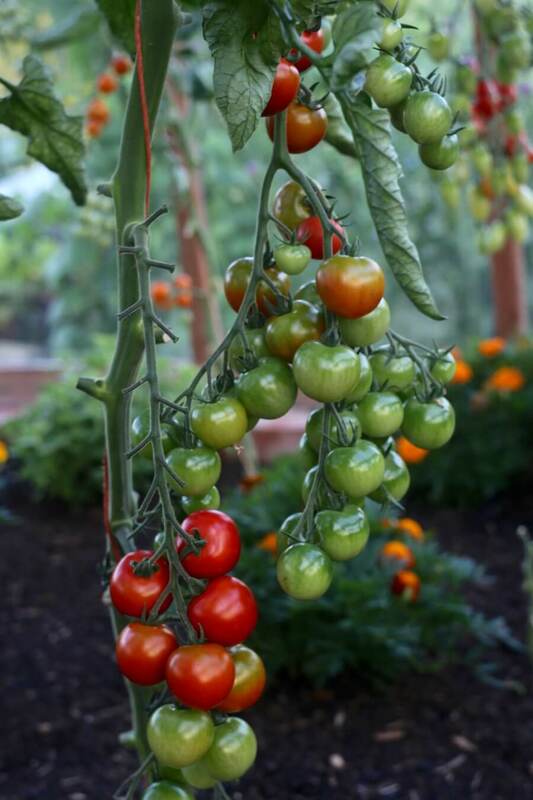 This concentrates growth and ripening into fruits and means less green tomatoes when plants are cleared in October. 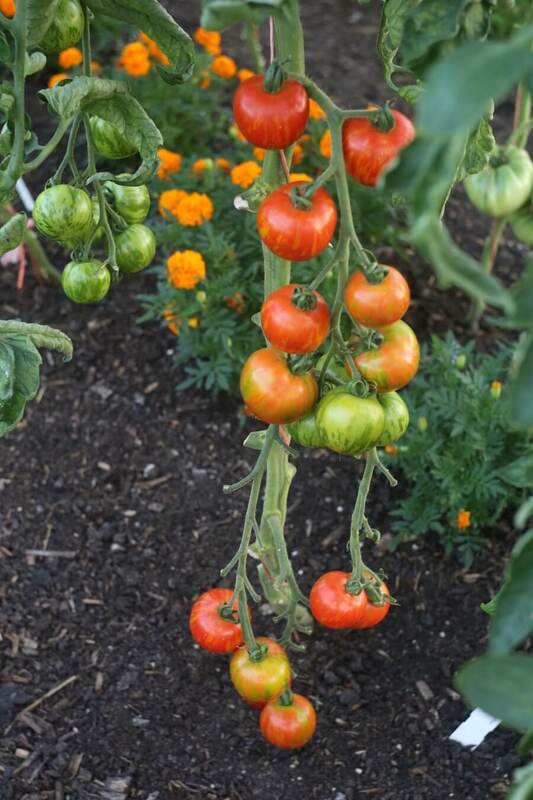 I have already pinched out the tops of outdoor cordon tomatoes. 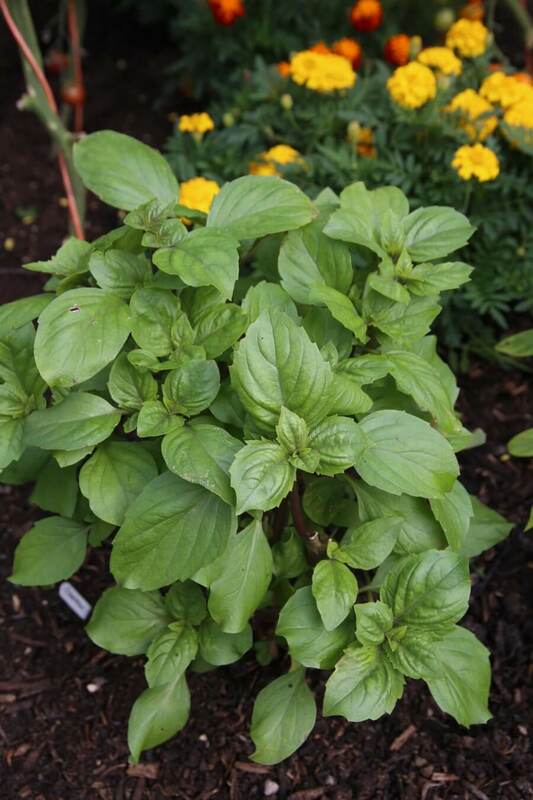 In the UK climate, basil often suffers from heavy summer rain and relatively cool nights, causing brown discolouration of leaves. All of mine is undercover and I am grateful for that after 12 days of heavy storms. We pick it weekly, all the new shoots, and I prune plants too, removing some stems to allow new growth. 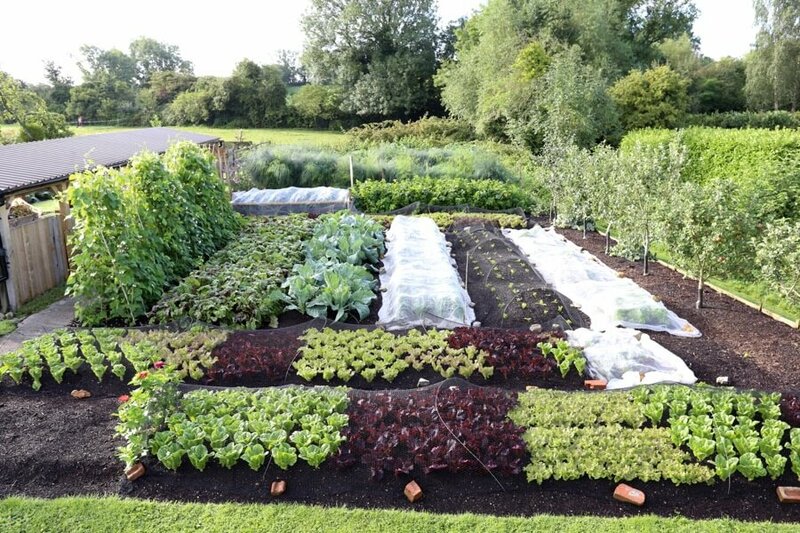 The trial beds this year are continuing the theme of the previous ten years, showing slightly stronger growth and bigger harvests on undisturbed soil. Not always, there are interesting variations. 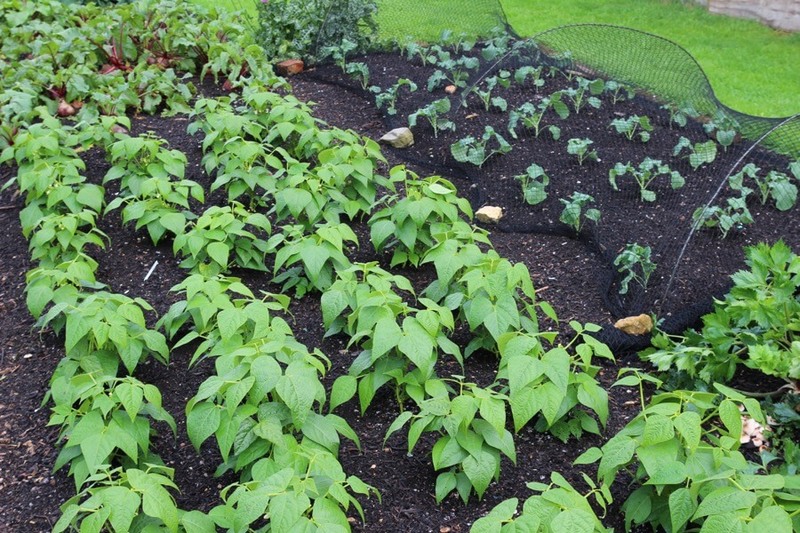 In the photo of three strips, where the left hand one has its beds forked/aerated but not inverted (see video), the climbing beans have not enjoyed growing in disturbed soil. 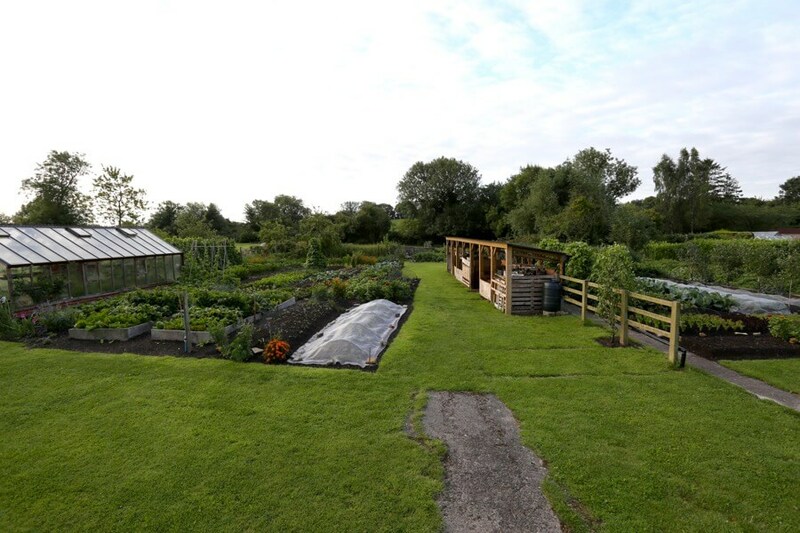 The strip of forked beds on left has given slightly lower harvests so far of everything except broad beans.Legumes seem happy in forked and dug soil. 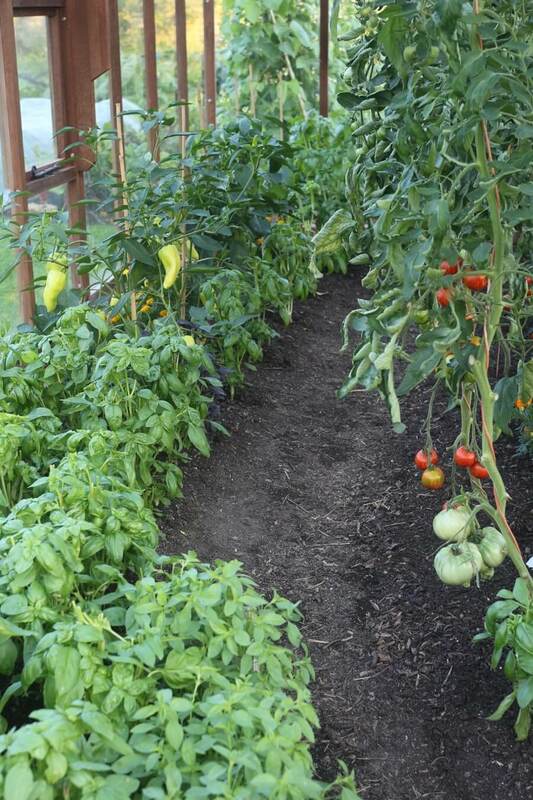 Food gardens can be so beautiful. This is one aspect of a video we shall film soon, Homeacres fifth summer, including the ornamental beds and fruit. The fourth summer video of July 2016 has been so popular with 660,000 views and counting. 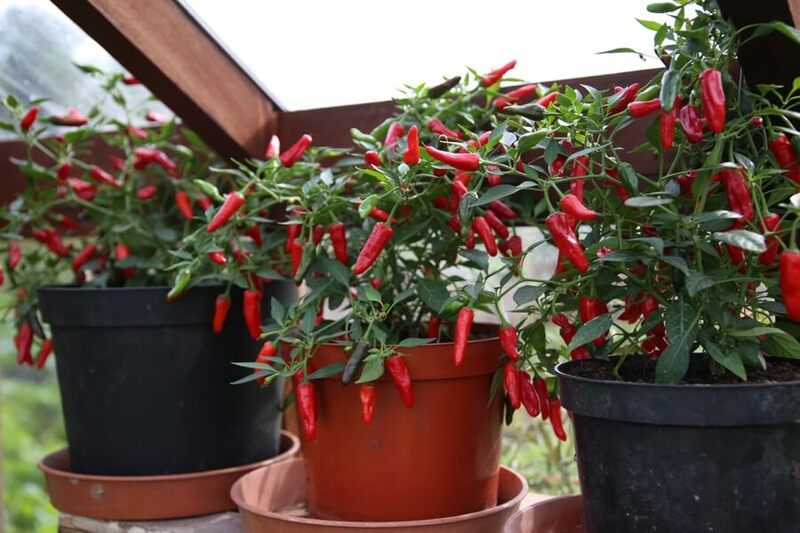 Apache chilli was sown Christmas Eve! Regular picking of outer leaves serves to keep slugs and mildew under control. 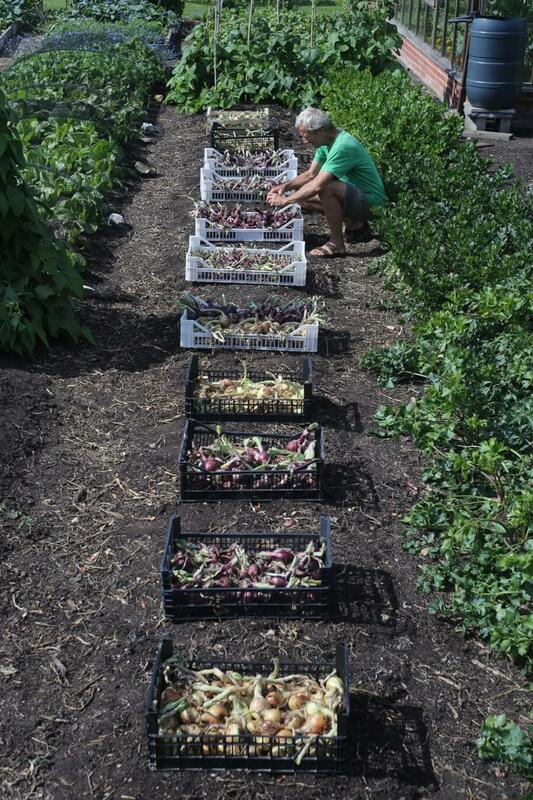 We pick with two buckets so as to remove all discards to compost, leaving the beds immaculate always, with less pest and disease. These lettuce planted on 26th June (sown 1st June) should crop until late September, as long as root aphids are not abundant. 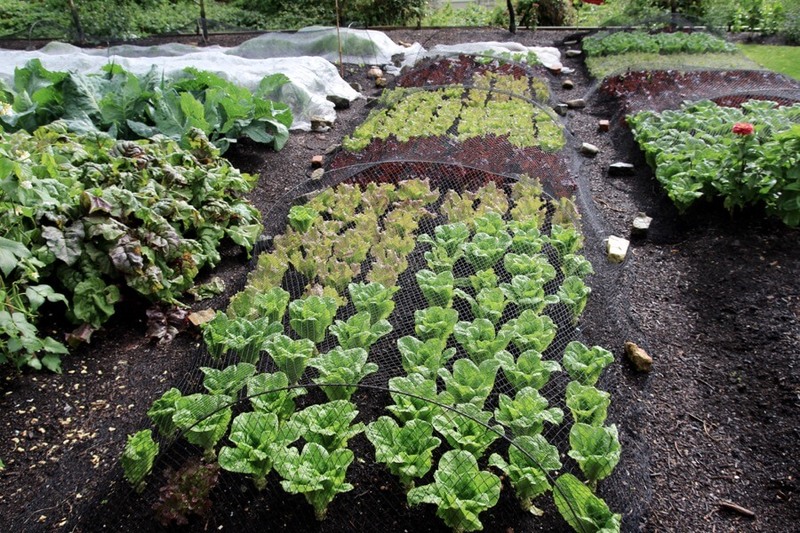 I have some endives and chicory in reserve, plus new sowings of rocket and mustards. I grow Tanya outside, and two plants in a 5ft/1.5m row have given 5kg already. They were sown mid May, planted mid June after spinach. Until recently I was watering them and have stopped now probably for the rest of the season. 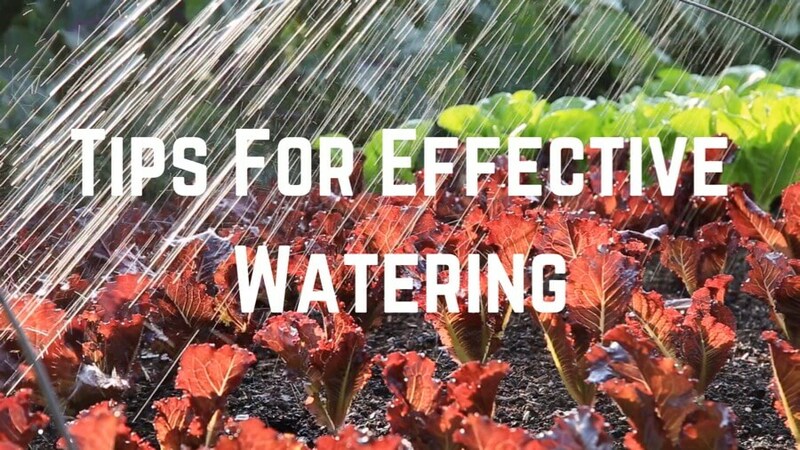 Our main watering is now undercover, and of any new plantings to help them settle, see more on watering in this new video. 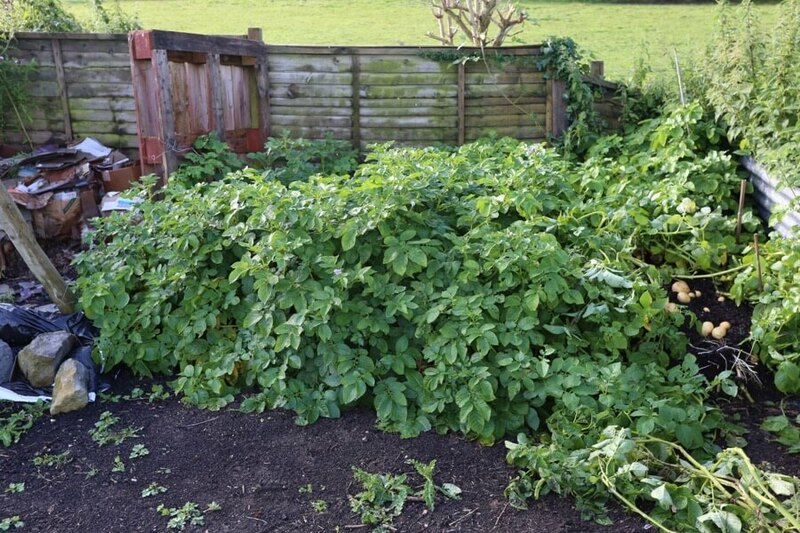 Late blight is now prevalent in the UK and as soon as you notice damaged leaves of potatoes, it’s best to cut off all stems. 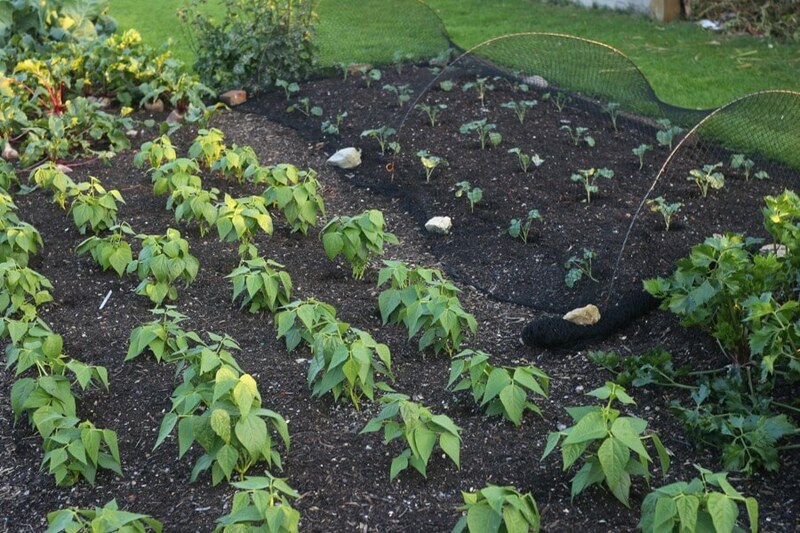 to reduce the likelihood of blight spores infecting tubers. You can compost all those blighted leaves and stems because blight spores cannot survive without living tissue to feed on. 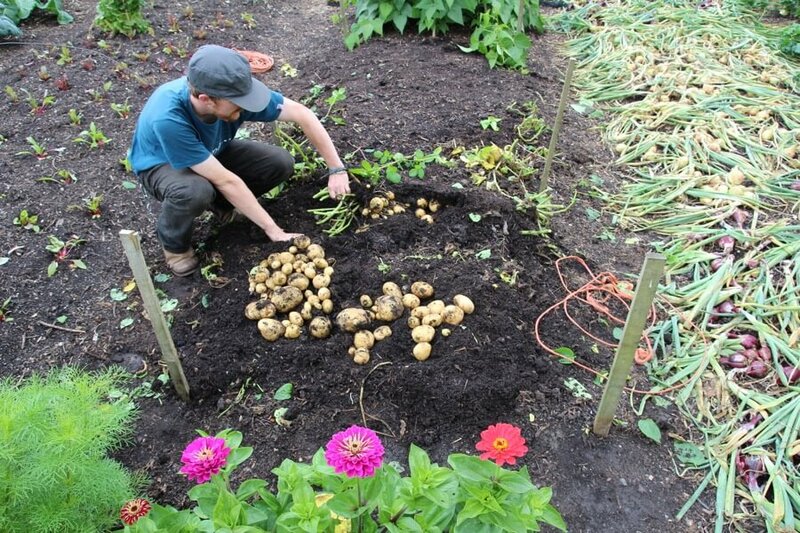 I prefer to pull potatoes straight after cutting the stems off, since they only get eaten by slugs if left in the ground. 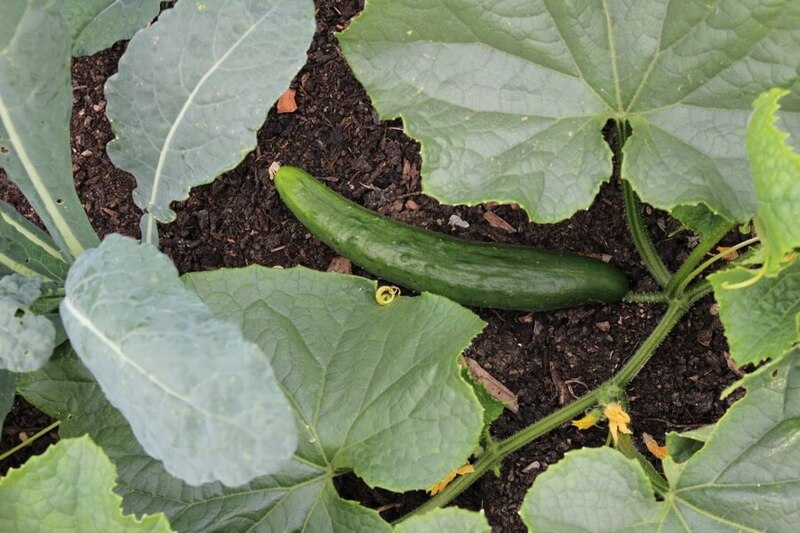 An earlier harvest allows you to plant something else. 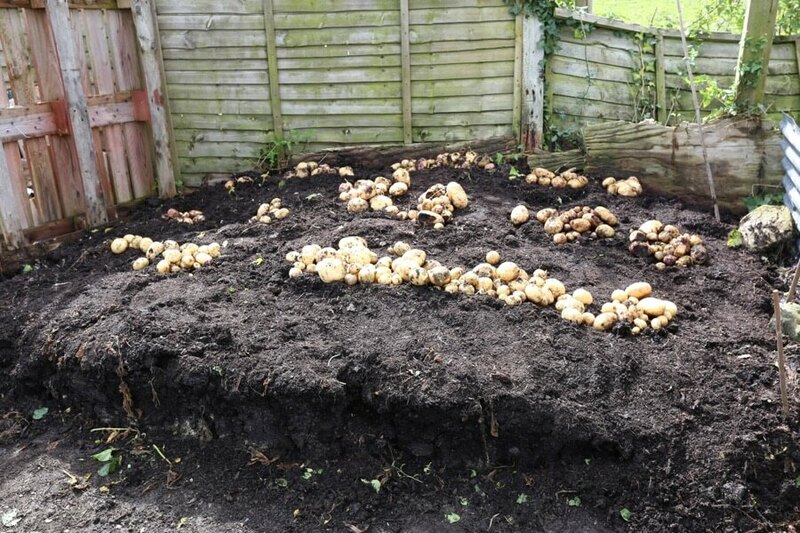 This year I had an unused pile of old cow manure and planted second earlies there in April, see the harvest below. My last sowing of dwarf French beans was in early June. 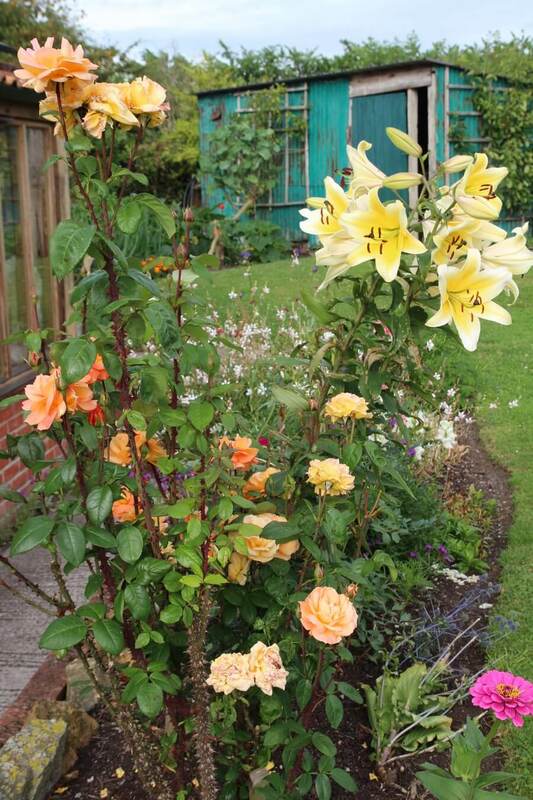 In warmer places such as London you can sow as late as early July. 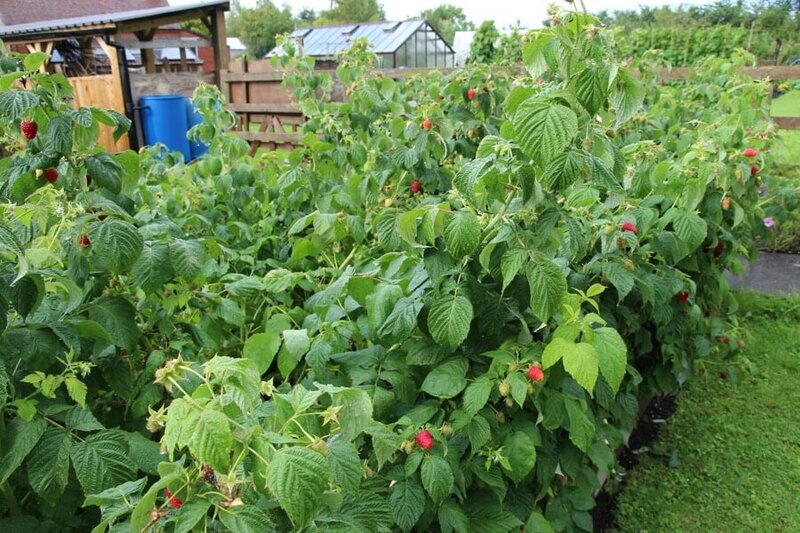 They are growing strongly now and should crop in September, when the first plantings are giving much less. 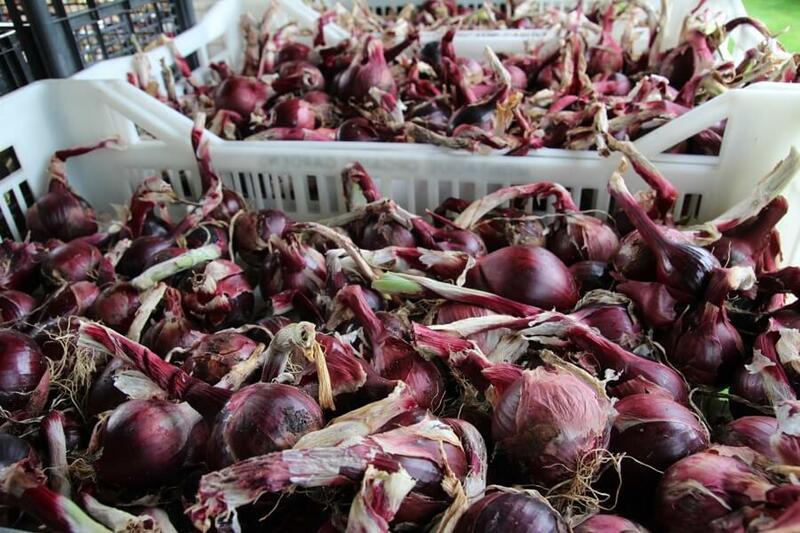 Great advice on the differance between onion leave and stems. But for the potatos are you saying that maincrops showing signs of blight are ok to harvest now for storage? They don’t need to stay in the ground for the skins to harden for longer storage. I know there are other factors and everywhere is different. But you think its ok to harvest maincrops for long storage now at the start of August. Thanks always look forward to the updates every month. Great work. Yes I find that as long as tubers are dry when going in a sack, they develop skins in the sack and store very well. Even from pulling in mid July, I have kept Charlotte until April, the tops were half green at harvest. Ok great. Looking forward to seen the results. Thanks very much. Looking forward to Septembers post already. Take cae. 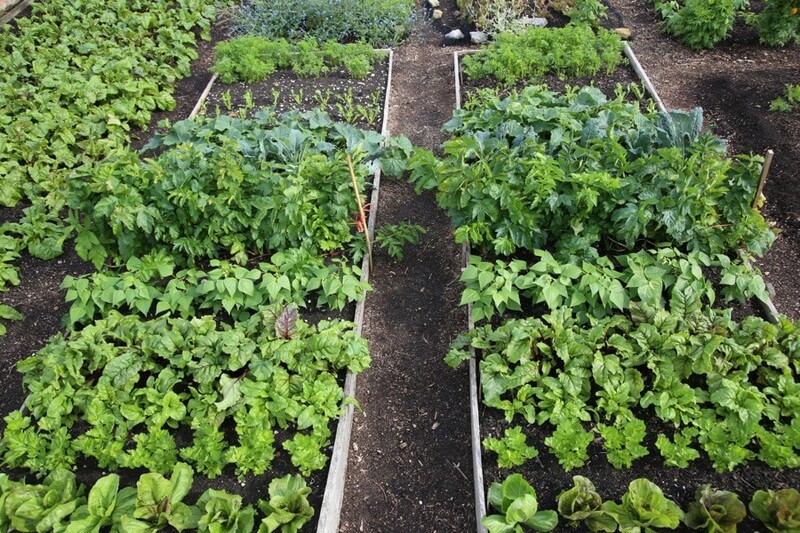 First ever question, I have been following your no dig and gardening guidance, and am loving the results from my small garden; I have sown, in modules in greenhouse, various kales, pak choy, cos lettuce and spinach…the seedlings are all about 1″ in size. Should I be getting them in the ground now? My greenhouse is tiny, but I am thinking of making a small poly tunnel over two of my raised beds to extend season. Any help gratefully received. Thank you. Hello MelBee and nice to hear you are enjoying good results. Small plants grow well when say minimum 1″ high, see this video for visuals of my planting sizes https://www.youtube.com/watch?v=9yl8LIs5t2A and yes, it’s summer, plant out! 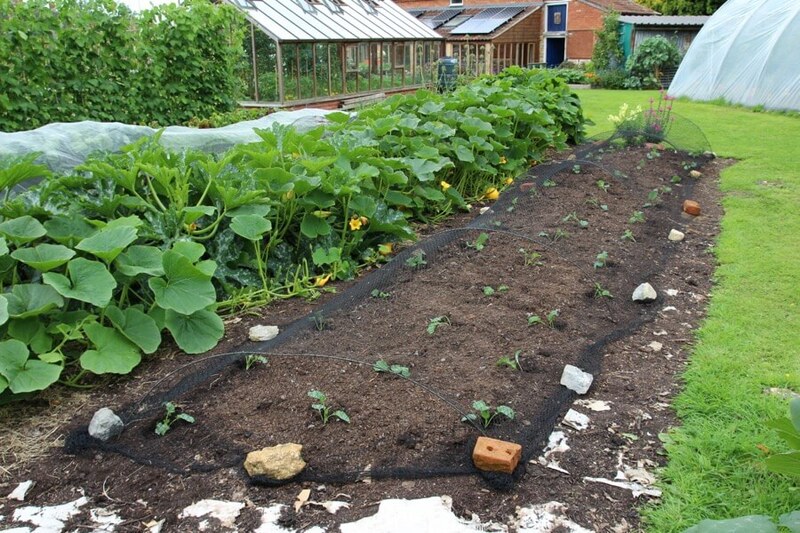 Hi, great to learn more about later sowings and what’s possible with over wintering spinach. Is there a NICE deterant that you Know about ?